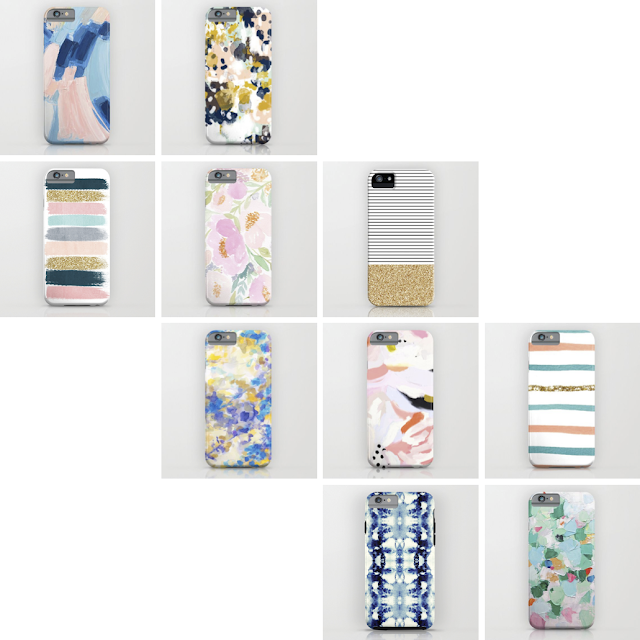 I recently got an iPhone6, so naturally I spent way too much time trying to find the perfect case that I wouldn't get sick of and wasn't something I've seen everywhere else. (I'm a classic trend ditcher... if something becomes wildly popular and ubiquitous I steer clear.. I've been this way since I was a kid. I think I picked it up from my older brother who was into finding new music and then ditching it when it got mainstream. I guess he was like an old school hipster, except he was goth... which I guess is like the OG hipster. Any way, back to the cases. I decided to search some of my favorite artists and see if they sold iPhone cases. I found the website Society6 which independent artists can sell their work on a variety of different products. I am so obsessed with this. Now instead of shelling out hundreds for a painting I'm not sure where I would hang, I can buy a work of art for a shower curtain or tote bag. I'm dead serious and this post is in no way sponsored. I love that it's an option to access art in an affordable option. It also helped me find some new artists to follow, which I previously mention is my new past time. To note, I got the "tough case" because well, little hands love stealing my device. It's perfect, not chunky or bulky at all and so far so good with all six of our klutzy little hands. holy crap. Talk about a new addiction.. and seriously every one of those cases is amazing. Top two are my favs, especially in an artsy way. i'm always on the hunt for a new iphone case. . . my phone feels all shiny and new with a new case slapped onto it. so i'm on my way to society 6! THANK YOU!!!!! I have had my iPhone 5c since October and have been on the search for a case...they're hard to come by! Seriously, I had my iPhone 4 for 4 years and only had three cases, I would have prob had two if the second didnt crack and get annoying, I figured this case I'd keep forever, but I already see others I want. I love going on Society6! You can spend so many hours scrolling through artwork, pillows, etc. I love the second one on the top row the best. I LOVE this!!! Those cases are so gorgeous!!! I have a plain, boring pink one and have been looking for something fun and new and these are so pretty! I'm going to check out that site now! Pretties..!! I need/want a new phone case, I'll be checking these out for sure. :) I love that you can get certain prints in various 'forms', such a fun idea.